The Vancouver Whitecaps were the designated team off this weekend in MLS action giving the team a chance to rest and reflect after a “hard done by” shoot out loss to Toronto FC in the Amway Canadian Championship. the ‘Caps young lineup reversed the losing 1-2 scoreline from the week forcing the game into extra time and penalties before finally falling to the visitors from the east. Off the field for Vancouver rumours persist that Nigel Reo Coker’s days are numbered as a member of the club. “NRC” started the first three games of the season before getting into a losing scuffle with a Vancouver bike rack and has only played once since in MLS although he did start at right back in the Canadian Championship games. Don;t be surprised to see the 30 year old moved on and out. Toronto FC made some player moves of their own after their win over Vancouver mid-week moving Canadian Issey Nakajima-Farran and allocation money down the road to Montreal in exchange for defensive midfielder Collen Warner. Toronto FC head coach Ryan Nelsen said TFC had been chasing Warner for a while. The fan reaction on twitter to the trade was less than supportive as many felt that the 30 year old “Issey” had done everything asked of him by the club and more. Saturday afternoon’s win over the visiting New York Red Bulls probably went a long way towards pacifying the crowds as TFC put in arguably one of their better performances winning 2-0 and (sort of) extended an unbeaten streak to three games including the two wins (one by shoot out) over Vancouver in the Canadian Championship. 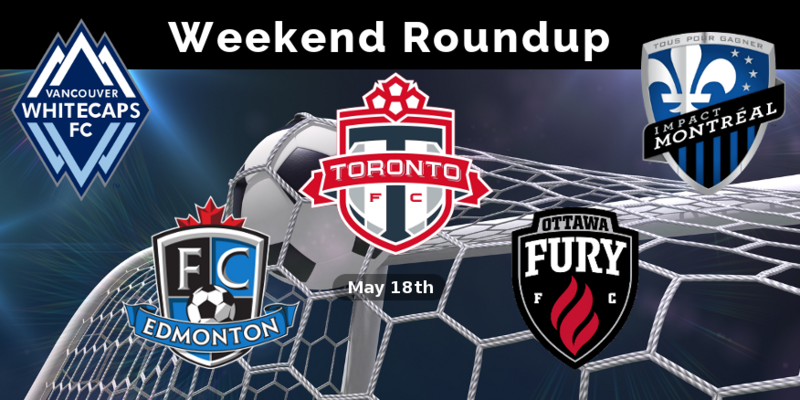 It was Toronto’s English strikers coming to the forefront and Jermain Defoe and the recently acquired Luke Moore found the net to give the Reds the win over their Eastern Conference rivals on Saturday afternoon. Defoe’s goal, a screamer to the top of the goal, opened the scoring for Toronto FC in just the 12th minute, and the score remained the same until Moore added the second deep into second half injury time to give Toronto their first league win since April 5th when they beat Columbus by the same score as they evened their record at 4-4-0. The good news for Montreal was they didn’t lose but settled for a 1-1 tie against DC United. The bad news is for a team mired in last place in the Eastern Conference with a 1-4-5 record they need all the wins they can muster and the game Saturday was there to take. The Impact opened the scoring in the 56th minute when Justin Mapp pounced on a poor first touch by DC’s Christian Fernandez cut the ball back to Jack McInerney who took a touch before sending it into the net. The Impact could not hang on though as Eddie Johnston scored his first goal of the season in the 83rd minute to give United a share of the points. In NASL action the Ottawa Fury recorded their first road win as a team beating their expansion brethren the Indy 11 by the score of 4-2 in front of another sell out crowd of 10,285 in Indianapolis. The win vaulted the Fury into 6th place with a 2-1-3 record. Midfielder Tony Donatelli scored twice, while defender Omar Jarun and forward Oliver added another each to give the visiting Ottawa Fury FC a 4-2 victory against Indy Eleven at IUPUI’s Michael A. Carroll Stadium on Saturday evening. The Fury have been nothing if not efficient in front of goal and the game in Indy was no different. Out shot in almost every game so far the Fury have managed just 53 shots in six games (the Cosmos lead the league with 98) and managed just 25 shots on goal so far. On Saturday despite being out shot 18-9 and managing just five shots on target they scored four times giving them 11 goals on just 25 shots for the season an incredible conversion rate of .440 – for comparison’s sake league leaders Minnesota are at .297 scoring the same number of goals but on 37 shots on target. For Edmonton FC it was never going to be about shots on target in San Antonio it was going to about trying to survive after defender Mallan Roberts was red carded after his high kick made full contact with Stephen DeRoux’s face. From there in it was about damage control for the Eddies in the heat, on the road and in front of 7,087 as the Scorpions poured on the pressure. Final tally in a chippy affair that saw seven yellows in addition to Roberts red the Eddies were out shot 17-3 while managing zero shots on goal but the scoreline read 0-0 and that’s all that mattered at the end of the day. The Whitecaps host the Seattle Sounders Saturday in the first of back to back Cascadia Cup matches as they travel to Portland the following week. The Sounders are currently in first place in the Western Conference but recently had a five game winning streak ended by the New England Revolution by the unflattering score of 5-0. Seattle did bounce back with a 1-0 win over San Jose this week. Toronto travel to Sporting Park in Kansas City for a rare Friday night game looking for an even rarer win in the mid-western city. Toronto’s record in Kansas is 1-1-7 the only win a 3-2 victory back in March of 2009 when Sporting KC had a different name and were playing in Community America Ball Park. At Sporting Park TFC have lost all four games being outscored 11-3 along the way – last July’s 3-0 loss the most recent result. Montreal meanwhile travel to Colorado to face the Rapids. Just the fourth meeting all time for the two sides Montreal has never beaten Colorado losing both visits to Denver 3-2. Expect more changes in the roster leading up to Saturday’s match. In NASL action Ottawa will play host to San Antonio while FC Edmonton also return home to face the Atlanta Silverbacks. A win for Ottawa, depending on other results could vault them as high as fourth in the standings matching head coach Mark Dos Santos pre-season goal for the club. For Edmonton a win combined with an Ottawa loss would move the Eddies one point ahead of the Fury in the NASL standings.